Hometown Bar-B-Que opened in Red Hook, Brooklyn, in September 2013. We specialize in authentic, pit-smoked meats prepared in the classic Southern technique of smoking on oak wood. We also incorporate a variety of flavor profiles that represent our local communities. Hometown also serves up a wide selection of traditional sides and dessert. Our two bars feature craft beers, a wide range of American whiskeys, seasonal cocktails and a selection of wines by the glass and bottle. 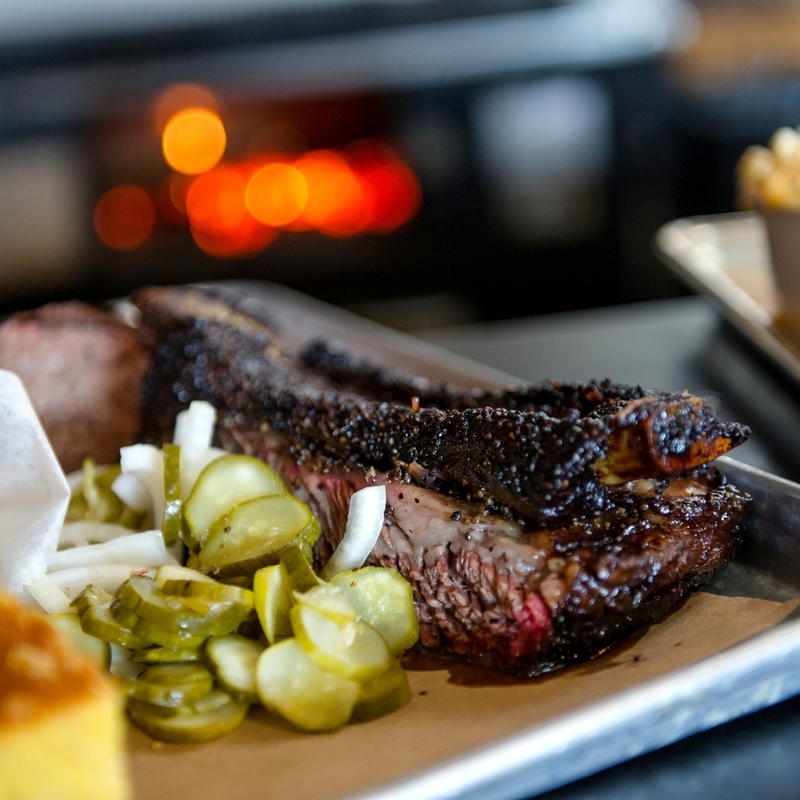 In classic barbecue style, we offer walk-up service to our counter on a first-come, first-served basis—until we sell out of that day’s specially cooked offerings. To make the wait enjoyable, chat with fellow diners, order drinks from the bar and listen to live music on weekend nights. 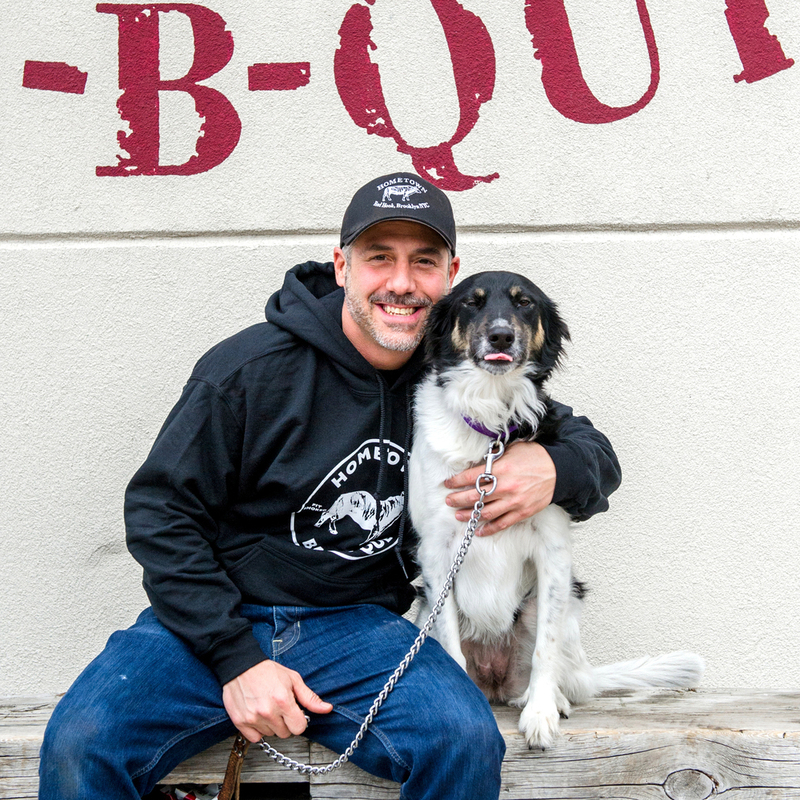 After almost 20 years in the security and private protection field, during which he kept a close eye on some of the country's most public figures, Brooklyn native Billy Durney has fulfilled a longtime dream by taking the helm as pitmaster and owner at Hometown Bar-B-Que. Since first learning to smoke meat as a youngster during visits to his grandparents' cabin in rural Pennsylvania, Billy has spent years obsessing over his barbecue, traveling around the United States and abroad perfecting his techniques. Starting in the backyard, cooking for family and friends, he has now realized his lifelong passion for wood, fire and meat. Billy can be found making the rounds at Hometown every night, stopping at every table to check on his guests. "I appreciate them coming here," he says. "That's the reason I work 80 hours a week." As general manager for Hometown, Mitchell Rosen draws on a wealth of experience working in such New York culinary institutions as the Grand Central Oyster Bar, City Crab and Bubby's. A self-described "people person," Mitchell oversees all operations at Hometown from the kitchen to the live music program. Rosen began his higher education at University at Albany, SUNYAlbany before his love of cooking led him to the Culinary Institute Of America, where he graduated with honors in 1994. From there, he trained as a sommelier but found himself increasingly drawn out of the kitchen and into management. 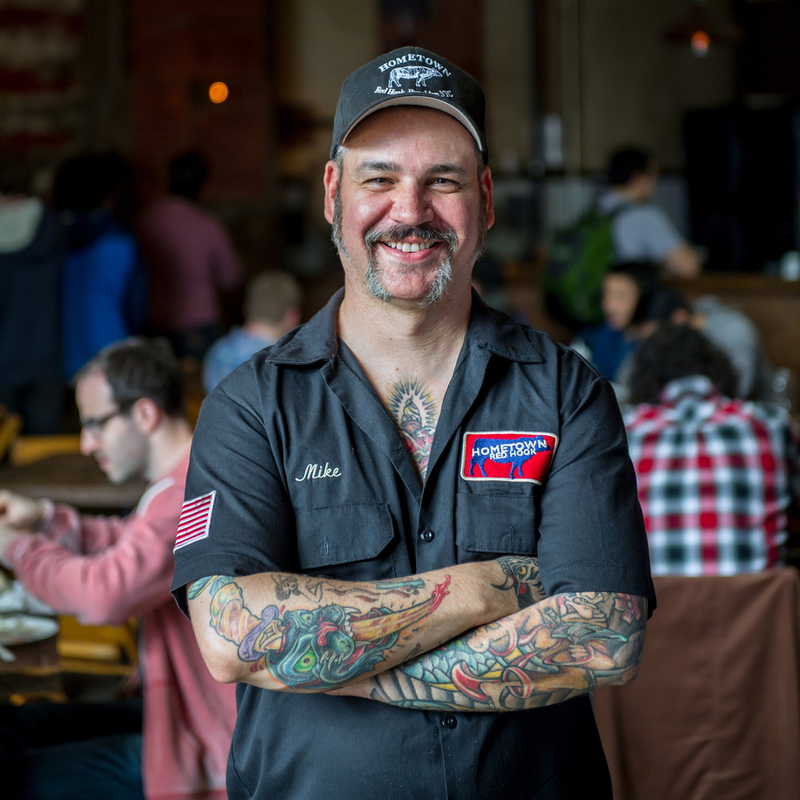 As Pit Boss for Hometown, Michael Conlon leads the pit crew through long nights of sitting on fires and smoking our barbecue. He draws on his experience as a former cook at some of New York City’s great restaurants, including CraftBar, Chanterelle, and Franny’s. After leaving his former career in the Radio and Record industry, Michael turned to his first passion, food. It wasn't until he began cooking with wood that his passion found its direction. Having cooked with wood burning ovens and grills, Michael jumped at he chance to finally cook proper barbecue. Michael began his higher education at Brooklyn College CUNY before attending The Art Institute of New York, where he graduated in 2004. What type of Bar-B-Que do you serve? We serve Brooklyn style barbecue. We apply authentic southern cooking techniques and use only wood to cook. After the smoking process, we manipulate flavors to create dishes that represent the flavor profiles found in the diverse, multicultural city of Brooklyn. Some examples include our Vietnamese Wings, Caribbean Jerk Baby Back Ribs, Lamb Belly Banh Mi, Oaxacan-Style Tacos and Fried Korean Sticky Ribs. While the line can be intimidating, we hope it can also be welcoming. At our busiest times, the line can take over an hour, but the wait for pit-smoked barbecue is part of the culture and experience we hope you'll enjoy at Hometown. It's our goal to keep you informed and occupied while you wait, so grab a drink from the bar or from a server and make the line worth it. We ensure that you get fresh cut-to-order meats and our carvers and cashiers are there to guide you through any questions you have. Our meats are sourced from some of the best small family owned farms in America as well as local farms here in the New York and New Jersey areas. How much Food do you recommend ordering per person? The carvers and cashiers can help with quantities when ordering. We do not offer platters, samplers or combo plates, but we do recommend dining in groups and ordering a la carte from the menu to get a variety of items to your liking. Our mac & cheese, coleslaw, potato salad, whiskey sour pickles, cornbread and sauces are all vegetarian. Everything on our menu is gluten free except our cornbread, mac & cheese, hot & sweet sauce and our wings. Who do I contact for Music Bookings? Yes. Generally, if there is a New York sporting event it will be on the screens. We try our best to stay in tune to what is going in all sports areas but we are not a sports bar. Can I order take out? Yes. Takeout orders are accommodated at the counter. Please tell your carver you would like your order to go and it will be packed up for you. We do not accept takeout orders over the phone or through email. While we do not deliver, we do offer offsite catering for groups of 45 or more. For more information, check out the Catering and Events section. Do you book private parties? We offer limited in-house events, and full service off-site catering to fit your needs. For more information please check out the catering section. Come VIST US WITH A Ferry to Red Hook. RunING daily.